The promotional copy on the website claims that it "doubles as a large planter". They probably just wanted to add extra "features", but I've never thought of using a sandbox as a planter. This is a pretty attractive sandbox (compared to those giant red crabs and green turtles) and it's just the right size for us, but I have a feeling that those plastic stones would look tacky filled with soil and potatoes. 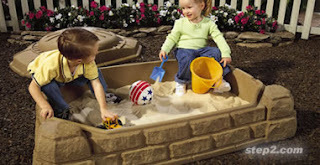 So, dear readers, please let me know if you think this is a) nice, b) tacky, or c) a nice sandbox and a tacky planter. Or something else entirely! It looks like a good sandbox! As you say, it isn't shaped like a turtle or a ladybug. I wouldn't want to have this as a planter in my garden. I'd find it tacky, but then that's my taste speaking.